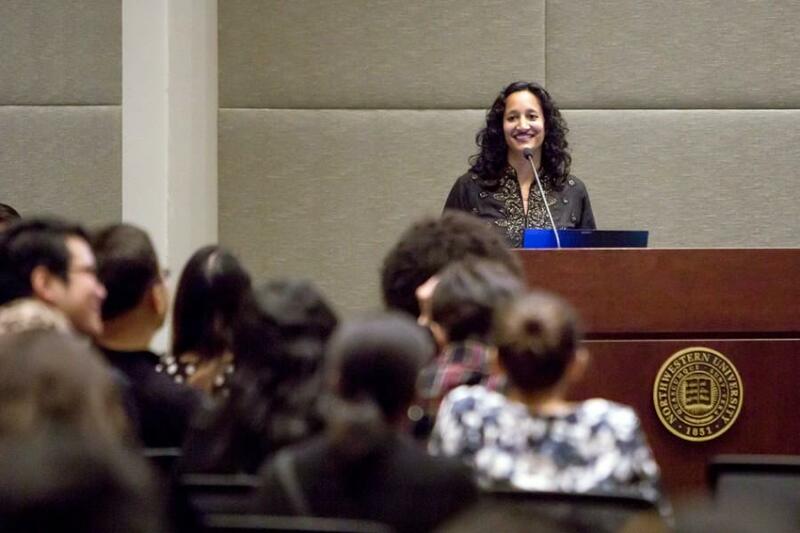 Sumun Pendakur (Weinberg ‘98) speaks at Hardin Hall 20 years after her participation in a hunger strike for the creation an Asian American Studies Program. This quarter, students are demanding an Asian American studies major through an online petition released Tuesday. Students renewed calls for an Asian American studies major with an online petition launched Tuesday, just as faculty in the program prepare to submit a proposal to Weinberg administrators that would enact the major. The University currently offers a minor in Asian American studies, but students must apply to complete an ad hoc major if they want to study the subject further. Weinberg senior Kevin Luong, who minors in the program, said he launched the petition. Luong, Associated Student Government Senate’s representative for Asian Pacific American Coalition, Taiwanese American Students Club, Chinese Students Association and Korean American Student Association, said the current system, in which students who want to major in Asian American studies can only do so through an ad hoc major, discourages students from studying in the program. He said Asian American studies has helped him understand his experiences within the larger context of ethnic studies. “It gives a space for narratives and stories that aren’t often told,” Luong said. History Prof. Ji-Yeon Yuh, who directed the program from 2005 to 2010, said Asian American studies faculty are close to finalizing a proposal that calls for a major. She said they hope to submit the proposal to Mary Finn, Weinberg’s associate dean for undergraduate academic affairs, by early November. Yuh said administrators tend to be cautious when approving a new major. “I would doubt that the dean’s office is as enthusiastic as the faculty in our program are,” she said. For a major to be created, Weinberg faculty would have to vote to approve the proposal at a faculty meeting, which are held once a quarter. Yuh said proponents of the proposal hope to introduce it during Weinberg’s Winter Quarter meeting and have fellow faculty vote to approve it during Spring Quarter’s meeting. She said she thinks Weinberg faculty will support the proposal. If they approve it at their spring meeting, Yuh said the Asian American studies program hopes to offer classes toward the new major as soon as Fall Quarter 2016. Anthropology Prof. Shalini Shankar, who directs the program, said students need to show their support for the program to Weinberg administrators. In February 1995, students proposed creating an Asian American studies program to then-University President Henry Bienen. That April, after Bienen declined to commit to creating such a program, students began a hunger strike in protest. The strike was intense: Participants took vitamins for sustenance, and the Conservative Council, a right-leaning student group, tormented the protesters by distributing pizza near their tents. One striker, who lasted 12 days, lost 20 pounds. An Asian American studies program was established four years later, in 1999. Yuh said that if the major is approved, she hopes an increase in resources will follow. She said the program currently operates with a “minimally sufficient” number of faculty. SESP junior Matt Herndon, ASG’s vice president for accessibility and inclusion, said student activism helped lead to the Asian American studies program’s establishment in 1999, and that he hopes it will lead to the formation of a major today.